Welcome to Day 30 of Crafty October – a month of Halloween ideas at The Purple Pumpkin Blog! Don’t forget to check out last year’s ideas if you need more inspiration. We’re not having our Halloween party until the weekend. I’m rolling it in with Guy Fawkes Night which is on 5th November. Having been so busy (as always!) I haven’t given my costume any sort of thought, and to be honest there are many years where I haven’t thought about what to do until a few days before! As a plus size girl, ready-made costumes for me are few and far between – and really expensive, which is why I tend to resort to some make-up, a black dress and some accessories to turn me into a witch of some kind! I thought I’d share costumes from Halloween parties gone by, along with costumes that my family and friends have worn! There is a definite pattern to who dresses up as what! I know that the majority are last minute ones. It doesn’t take much to slap on some make-up and find cheap accessories in the shops to allow you to dress up for Halloween. Without further ado, here are some ideas for Last Minute Halloween Costumes! Along with the photos I’m going to share some tips on how to put together a last minute costume using stuff you probably already have at home…and if not, at this time of year you’ll find at least one cheap Halloween accessory somewhere…you really don’t have to spend a fortune on ready made costumes! I know, we may be at an advantage, as between us (my sisters and I) we have a lot of costume components! Tip #1 – Raid your wardrobe! Anything black, orange, green or red is going to work for Halloween. I call upon my selection of black dresses at this time of year! My sisters do the same with their wardrobes, finding things that they can wear to jazz up for Halloween. Us three sisters are all very different in shape, size and style! In this photo below you’ve got me in the middle dressed as a bat woman…hahahaha, I bought the wig because I thought it was super cute, and I had the bat deely-boppers in my Halloween stash (remember that I have been collecting Halloween stuff for years!!) My black dress and sheer jacket are from my wardrobe. Can’t recall where the choker came from! My sister, Maria on the left, she’s ace with make-up and I really should have got her in to do a make-up tutorial, but she’s been so busy with work that we’ve barely seen each other recently! Worse still, she has to miss this years party because of work :( I remember this year being a cheap one on the costume front, and she raided her wardrobe for black clothes. The wig, was one she had in her costume stash (she is an actress so has plenty of costume stuff!). She was some sort of Spider Woman – the veil and the mesh around her skirt was actually a cheap Halloween table cloth! Jo, on the right, did pre-think for this costume as she found some pumpkin gloves and a balaclava somewhere (don’t ask where, it was a few years back now!) The pumpkin wand is an old decoration, and the feather boa came from the Poundshop! Jo often just jazzes up her regular clothes – she’s wearing jeans and a t-shirt! From the same party, my brother-in-law, Richard dressed up as some sort of zombie. Wearing a suit from his wardrobe, throwing over some cobwebs (which are really cheap to buy in the shops at this time of year) and then Maria doing his make up. My other brother-in-law, Phil, as a vampire…with a t-shirt and jeans and a cheap mask! Jo’s done the whole pumpkin fairy thing a few times now! Tip #2 – Buy a mask…or a hat! It’s the easiest way to dress up for Halloween!! The photo below is of my brother (he’s so handsome!!) who came to one of our parties after work with a mask he threw on! Easiest witches costume…black clothes and a black rubbish bag for a cape! Some clothes from her wardrobe and some shop bought cat ears! The Grim Reaper is an easy costume…you don’t even need a black cloak as Phil demonstrates above! If you’ve got a black bathrobe, that would work! One year, both hubs and son dressed up as the Grim Reaper. It’s one of the cheaper store bought costumes! Tip #3 – Buy things you can use again and again! If you do go down the shop bought route, which over the years I have done for my hubs and son, then buy things that can be used over and over! Hubby has dressed up as Count Dracula many times over the years! And Liam got a few Halloween parties out of the skeleton costume! 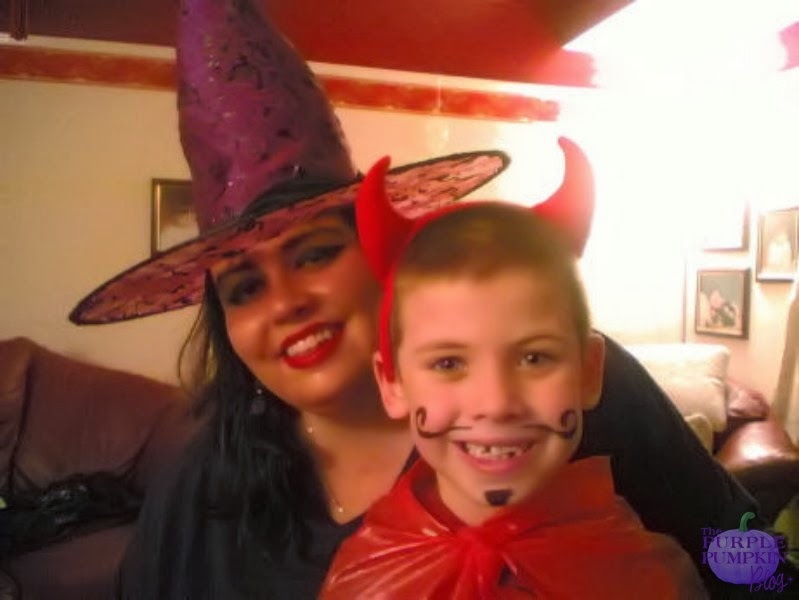 It doesn’t even have to be a whole costume – he’s wearing a red top under a red plastic cape and devil horns! The ‘tache and beard I drew on with eyeliner! My brother made the scariest serial killer one year…with a plastic chainsaw I will add! Face paints are cheap, or go mad with your make-up box and create a look…I went with a very pale face and pink eyeshadow here. Some sort of voodoo witch this year with bright green eyeshadow and dark eyeliner. My sister working her make-up magic on her husband’s freaky jester ensemble! And my bro got bi-zay with green face paint and black eyeliner to turn himself into Frankie! I think our friend was going for the Joker with his make up here! Then, sometimes, I don’t even need to dress up! 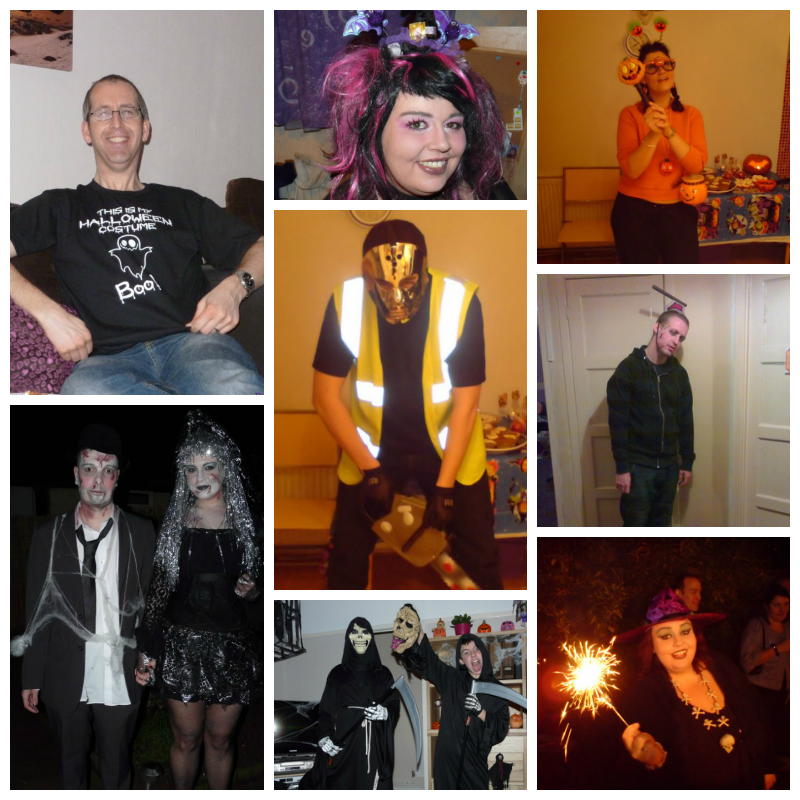 This photo is from the year that I started my blog and we had threw a Better Late Than Never Halloween Dinner Party. I still felt ‘Halloweeny’ and all it took was a little top hat! Hubby’s costume that year was the best though! It’s So Fluffy, I’m Gonna DIE! | Project 365:2013 – Day 303	54 Not So Scary Movies for Halloween!